A re brief at 11am was called to assess the conditions on take off so we had an hour in which Gerolf gave us an excellent talk on sprog heights and the ramifications of having too low or high settings. We had a glider this morning checked with 2.6 degrees which means no sprogs!!! Do you all know what your sprogs are set at?? We had a forecast for strong north winds especially later in the day so a task was set via 4 turn points (la ghache, de lure, malijai, entrevennes) to puismoisson with a distance of 74k and an entry start. The sky was full of wave up wind and blue down wind. Take off on the lower north was a tad difficult with the wind a bit strong and often from the east. All got off safe! Climbs were to 9500 feet (I wish) I only got to 8000. Some had a good glide across the valley and some had 900feet down!!!! They landed earlyL All seemed straightforward apart from de lure which is usually a great climb but not today. 3 of us left with a 1-2 up and drifted across the valley into the turn point and then onto the flat lands and high plains where the thermals smell of the lavender as this is a main crop along with cereal. I got low near the last turn point and thermalled past it and had to fly into wind 1.5 k to get it. The instrument showed that I would make goal with 500feet to spare. I arrived with 2000feet!!!!!!!! The lift on the glide in was amazing but choppy so the glide was only at 50mph or less as I couldn’t hold on! Then you had to try and find some kind of sink as the whole place was going up!! 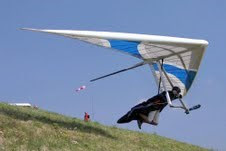 Probably around 30 in goal at the gliding club which was the goal on the last day of the pre worlds. My time was 1 hour 36mins give or take so not too bad. What goes on at the campsite at night?